Dry mouth is a condition where there is a decrease in, or complete lack of, saliva production. It is most commonly seen in cancer patients whose salivary glands have been affected by radiation or other medications. Dry mouth can also lead to difficulties in speaking, chewing, swallowing, altered tastes, and sleeping. Traditional ways of treating dry mouth include medications that lessen the side effects of radiation or stimulate the salivary glands, saliva substitutes and mouth rinses, and sucking lozenges or chewing gum. Acupuncture is gaining support as a valid intervention in palliative medicine. There are a few published research articles favorably showing acupuncture to improve symptoms of dry mouth in radiation patients. A research article published in the Annals of Onclology in 2013 compared acupuncture for dry mouth to education about oral care in 145 patients with radiation-induced dry mouth. Patient were randomly assigned to the acupuncture group, where they received group acupuncture every week for eight weeks, or the education group, where they had two hour long oral health educational sessions one month apart. Four weeks after the end of the acupuncture and education, the patients switched to receive the other treatment. Dry mouth symptoms were measured objectively with Schirmer strips, which determines the amount of saliva in the mouth, and subjectively with patient-reported changes. Although there were no significant changes in saliva production, acupuncture significantly reduced patient reported symptoms of dry mouth, sticky saliva, needing to sip fluids to swallow food, and waking in the night to drink compared to oral health education. Also worth noting is that those who received acupuncture had a quick response that was sustained over several weeks. ​There is no clear relationship between the subjective feeling of a dry mouth with the objective measurement of salivary gland production, therefore, it is highly unlikely that acupuncture is a placebo. The profound impact that dry mouth has on eating, talking, and sleeping, and that these symptoms were significantly relieved by acupuncture makes it difficult to assume these effects are the sole result of a placebo. This is not the only research that supports the efficacy of acupuncture for dry mouth. A randomized controlled trial of ear acupuncture showed dry mouth was relieved in 66% of patients, as opposed to 4% in the control group. Another research study found that a combination of body and auricular acupuncture treatments reduced dry mouth symptoms by 10% in 70% of the patients (35 total), 48% of patients reported greater than 10% improvement, and 13% reported the duration of effect lasting longer than three months. These studies support the use of acupuncture for dry mouth, however, for complete integration, further, larger, and more well-designed trials are necessary. Radiation patients with dry mouth are an often overlooked group, and the conventional ways of addressing the uncomfortable side effects of dry mouth are inadequate. Acupuncture is an effective, safe, and relatively inexpensive method of treating dry mouth that is easily integrated into a hospital or clinic setting. More questions? Let me know! This originally began as a video for one of my classes in my doctoral program. It was inspired by the recent, tragic suicides of Chester Bennington, Kate Spade, and Anthony Bourdain. The video isn't worth watching, but the ideas in it are good habits for daily mental health. The following are five habits, based in the wisdom of Chinese medicine, that have helped me and my patients keep life from careening off its tracks. In Chinese medicine, the world is comprised of five different elements- water, wood, fire, earth, and metal. The ancient Chinese believed that humans were also composed of these five elements. When these elements are balanced, health and wellness thrive. Each of these five tips are based in the physical or emotional expression of these elements to keep the body in balance. These tips might seem simplistic, but they are worth noting. At the very least, they can be used as a starting point to help you find your own mental health habits. If these daily tactics don't help very much or at all, Chinese medicine is an excellent option to help with symptoms of depression or anxiety and balance out the body. Therapy or medications will also help. And lastly, if you're experiencing irrational thoughts, sometimes all it takes to break them is one conversation with a rational person. Please don't be ashamed to reach out to a friend or hotline. Regardless of what has happened, is happening, or will happen in our lives, it's necessary to reach within ourselves and grow. It's our responsibility to ourselves, and just as crucial, to those who surround us and love us. What do you do daily for your "me-time"? Take care of yourselves. Much love. Deciding to quit smoking is one of the best commitments a person can make to better their health. Addiction to nicotine is powerful, and is the main reason why most people fail to quit smoking completely. There's a physical, mental, and emotional habit to smoking that makes it difficult to let go. Chinese medicine is not a magic cure for nicotine addiction. However, it can make it easier to quit and remain smoke-free. Chinese medicine will balance out the physical, mental, and emotional components of the body and help lessen cravings, irritability, jitters, restlessness, and aid in relaxation and detoxification. One of the best things you can do for smoking cessation and nicotine withdrawal is meditation. And one of the best forms of meditation is breathing. Breathe in, breathe out. First, sit tall in a quiet place and notice your breath. Then, breathe in deeply, allowing your belly to expand as your diaphragm drops and your lungs fill with air. As you exhale, your belly is pushed in towards your spine and your diaphragm rises. Inhale and exhale at an equal pace. For a little more, when you breathe, place the tip of your tongue to the roof of your mouth behind your teeth and breathe in and out quietly through your nose. End with one to three breaths with your tongue down and breathing in through your nose and out through your mouth. This breathing meditation is excellent to do anytime a smoking craving or irritability or anxiety feels overwhelming. A Chinese herbalist will be able to come up with a formula prescription specific for your withdrawal symptoms. Chinese herbs are typically consumed as a tea or capsules two or three times per day. Taking herbs daily is similar to receiving a daily treatment for smoking cessation. A wonderful combo to Chinese herbal medicine for nicotine withdrawal is acupuncture. Acupuncture will help to balance out your body's energy, detoxifying and repairing your internal organs damages by smoking, calming the nervous system, reducing cravings, and even changing how cigarettes taste. Acupuncture needles are placed at many different places on the head, ear, and body. Treatments are typically done three times per week at the beginning, then cutting back to once per week. While each person is different, it might take 15-20 treatments total to get over the initial nicotine withdrawal symptoms. I've seen Chinese medicine turn many smokers into ex-smokers. Have a specific question about your condition? Let me know. I'm here to help! Stress and anxiety can hurt your health. Although we're hardwired to handle stress, too much for too long takes a toll. A little bit of stress is a necessary and natural reaction to living in the world. Stress is your body's way of reacting to change, such as a threat, challenge, physical barrier, or an emotional wall. It affects how you feel, think, and behave, as well as how your body functions. Long-term stress causes severe muscle cramps, shrinks the size of our brains, causes weight gain, and even leads to heart disease. Chinese medicine is a wonderful choice to combat the day-to-day stresses we face to prevent chronic stress issues from developing. It will help you look and feel your best! Acupuncture- It's an important technique to improve circulation, increase the release of endorphins and serotonin, and decrease cortisol. Serotonin regulates mood, social behavior, appetite, digestion, sleep and memory. Endorphins activate the body's opioid receptors, triggering pain relief. Cortisol is released in response to stress, and chronically elevated levels of cortisol are linked to abdominal fat gain, cognitive decline, and compromised immune function. To get the most out of your acupuncture treatment for anxiety or stress, try to do an evening appointment or schedule time to take a nap after your treatment. Being able to rest after your treatment allows the effects to sink into your nervous system and integrate better with your body. Chinese Herbal Medicine- There are hundreds of herbs in Chinese medicine that work specifically to balance out your body to reduce stress' impact. There's lots of research showing certain herbs to have adaptogenic, sedative, and anxiolytic effects. Adaptogenic herbs help your body adapt to stress and have a normalizing effect upon it's functioning. Sedative herbs promote calm and sleep, and axiolytic herbs reduce anxiety. Some common Chinese herbs to help reduce stress are chrysanthemum, ginseng, astragalus, licorice, goji berry, and reishi mushroom. These are mostly found as teas or tinctures. If you'd like something more specific and potent, talk with a Chinese herbalist. Focus on your feet- Chinese medicine knows that our feet are connected to the earth and the energy of the earth circulates throughout our entire body. Our feet have vital points for health and well-being, so it's important to take care of them. Going barefoot, having a nightly foot bath, taking the time to massage your feet, or rubbing your favorite essential oil on the sole are wonderful ways to get out of your head and ground through your feet. Practicing these gentle, holistic, and non-invasive methods will give you improved immunity, vigor, functionality, and presence. Chinese medicine can mindfully help you get to where you want to be. Beauty From The Inside Out: Constitutional Facial Acupuncture! Constitutional Facial Acupuncture is a safe, pain-free, and effective treatment for renewing not only the face but also the whole body. Thin acupuncture needles are placed at specific points on the face and neck to tone sagging muscle, lift and improve the texture of the skin, and strengthen the body's natural energy. The points also stimulate blood circulation which improves facial color. Constitutional facial acupuncture is a series of 12-15 treatments, ideally once per week. The first treatment is an hour and a half and all follow-ups are an hour. The treatments include the acupuncture, lifestyle and nutritional recommendations, custom herbal formulas (optional), and beauty tools and tips based in traditional Chinese medicine. Of course, those who burn the candle at both ends or have severely drooping skin may require more treatments. For the vast majority of people, constitutional facial acupuncture would be a beneficial treatment. It is contraindicated with severe high blood pressure, severe migraines, post-resurfacing treatments, pregnancy, cold/flu, acute shingles outbreak, or acute allergic reaction. If you are having these issues, it would be beneficial to receive acupuncture to manage these before beginning a constitutional facial acupuncture series. After the first treatment, patients tend to notice an increased glow in the complexion, brighter eyes, and a more open face. This is due to the increased Qi and blood. A significant change can be seen after the fifth to seventh treatment. Faces look more rested and calm, lifting of the jowls, neck, and eyes has become more pronounced, wrinkles have lessened, the skin is more toned, and constitutional issues like insomnia or headaches have subsided. By the end of a series, patients can look and feel ten years younger. Although, results vary depending on how well patients take care of themselves during and after the series. At this point, maintenance treatments can provide ongoing support within the normal process of aging. Constitutional facial acupuncture is a non-invasive and less costly alternative to cosmetic procedures, drawing on the ancient Chinese wisdom related to beauty, longevity, and balance. If you'd like to try it yourself, please get in contact with me. I'd love to chat with you about it! How Bloodletting Can Help Your Pain! When I say "Have you had bleeding before? I'd like to try it to help your pain," I'm met with concerned stares and nervous chuckles. Patients are usually imagining losing copious pints of blood in a short amount of time. I'm quick to assure them that we're not living in the 1300s and knowledge and technology has improved! In Chinese medicine, bloodletting is purposeful bleeding from the surface of the body for therapeutic purposes. It's approach is to let blood in a state of stagnation or heat, i.e. diseased blood. This is unlike Western medicine's historical approach to bloodletting that lets large amounts of healthy blood from veins. Bloodletting has two of reliable actions on the body: improving circulation and clearing heat. When bloodletting is done over areas of visible blood stagnation, think spider veins, circulation is improved both locally as well as distally along the blood vessels. Bloodletting also clears heat locally and systemically. In injuries with visible heat and swelling, bloodletting gives a place for heat to vent and swelling to decrease. Bloodletting at specific, heat-clearing acupuncture points clears heat from the entire body. Secondary functions of bloodletting are the effects of improving circulation and clearing heat. They are: stops pain, detoxifies, disperses swellings, stops itching, and calms the nervous system. Fact: pain comes from stagnation. Therefore, treatment involves moving stagnation to stop pain. Moving stagnation means clearing out the stuck, old blood and replacing it with oxygenated blood to promote healing. It also helps to clear out metabolic waste and bring in nutrients to help heal. Swellings are enlargements due to accumulated blood, fluids, or pus. Directly opening a swelling with a lance allows fluids, blood, or pus to be expelled, therefore resolving a swelling. Most cases of itching in Chinese medicine involve blood not circulating normally and consequently failing to nourish and moisten the skin. Itching results. Treatment for this involves moving the blood, either with herbs or bloodletting, to move the stasis and allow the blood to come to the surface to moisten the skin. Calms the heart, settles the spirit. Heat is one cause of irritability and agitation. Blood stasis can likewise create mental confusion and possibly agitation, as in senile dementia. Again, since bloodletting both moves blood and clears heat, it helps calm the heart, settle the spirit, and help with mental disorders due to these patterns. To sum up, bloodletting is a safe, effective, and excellent treatment to manage your pain and balance out your body. Give it a try! Want to discuss your specific condition? Get in touch. I'm happy to answer your questions! Red crowned cranes are Chinese symbols of longevity. Reishi mushrooms (on the right) are known as "mushrooms of immortality." Title: Longevity Crane. Artist: Ling Xue. Longevity is the primary focus of Chinese medicine. It has to do with maintaining and circulating Qi in your body. My working definition of Qi is the force which creates us from nothing and animates life. As adults, our Qi comes from air and food. And good health comes from having proper amounts of Qi circulating in the body. ​Acupuncture regulates Qi. Herbs, food, and proper breathing supplement it. Therefore, acupuncture, Chinese herbs, balanced nutrition, exercise, and diaphragmatic breathing are all pivotal components to preserve and circulate Qi for good health and a long life. This post will focus on four Chinese herbs that can be taken every day for a long period of time to cultivate longevity. The following is a wonderfully simple four herb tea designed to supplement Qi and Blood. Qi and Blood deficiency, as well as a poor lifestyle (overwork, lack of rest, poor nutrition, inadequate sleep, etc), lead to many health issues. Therefore, gentle supplementation of Qi and Blood with herbs can help prevent many conditions. ​In this formula, Huang Qi is the chief herb. It is used to strengthen the Qi of all the internal organs. Xi Yang Shen is used to strengthen Qi and Blood. Although similar to Chinese or Korean ginseng, Xi Yang Shen is cooler in nature and protects body fluids. It also helps moderate Huang Qi's warm nature and makes the overall temperature of the formula neutral. The other herbs, Gou Qi and Huang Jing, nourish the Kidneys. In Chinese medicine, the Kidneys are the powerhouses of the body. Gou Qi Zi is neutral and has a light, moistening yet non-stagnating, nature and can be used over long periods of time. Huang Jing has the added benefit of strengthening digestion in combination with Huang Qi. In ancient times, Huang Jing was used by Daoists as a food substitute while fasting since it is very nourishing and treats poor appetite. These herbs are designed to be taken once per day, preferably on an empty stomach in the morning. If you're using raw herbs, they are decocted for a short time. I've been using this longevity formula and I love it! It's easy to change individual herb doses depending on what's going on in my body, it doesn't taste horrible, and it makes me feel good. I even think it helps to balance out my appetite. What more could you want? Enjoy this simple formula in good health. If you 'd like to get these herbs in a concentrated powder for easy administration, please let me know! Understanding Sadness in Chinese Medicine. Loss hurts. It takes your breath away, pains your heart, and leaves you feeling empty. Unfortunately, it is something everyone deals with at some point. So, I thought I would talk about some ways traditional Chinese medicine can make the grieving process a little easier and a little less painful. First of all, sadness and grieving are a natural and healthy response to loss. The emotions must be expressed so that they can be let go. Emotions only become harmful when they are long lasting, very intense, or not expressed. How do I know when my sadness is damaging? In Chinese medicine, sadness weakens the Lungs via the Heart. Grief and regret also have the same effect. This Lung weakness can manifest as breathlessness, discomfort in the chest, tiredness, deep sighing, crying, or a weak pulse. If these symptoms and emotional states continue for months or years, then they become a cause of disease. So, what can I do to help process my grief? Because sadness is associated with the Lungs, one of the most effective ways to process it is diaphragmatic breathing. My favorite breathing exercise is the 4-7-8 breath. Empty all the air from your lungs through your mouth. Close your mouth and place the tip of your tongue on the ridges on the top of your mouth. Inhale through your nose for a count of four, hold the breath for a count of seven, then exhale through your mouth for a count of eight. Repeat 10 times. Here's a video demonstration. ​Massaging the Lung meridian is helpful and may be sore when we are grieving. 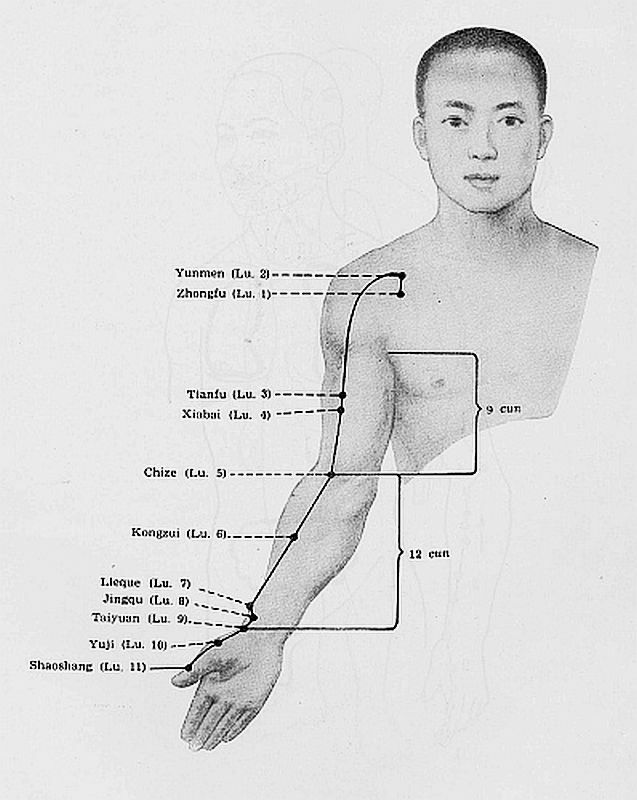 The channel begins beneath the clavicle near the shoulder, descends down the upper arm in the middle of the bicep and from the elbow crease towards the thumb nail. If any parts are really tender, stop and massage that spot a while until it's not tender anymore. For reference, here's a pic. Really, any movement you will actually do is helpful. Acupuncture and Chinese herbs are immensely helpful for opening emotional blockages so they can be released. Sometimes, patients are alarmed at their crying during a treatment, but they are crying because their sadness is moving and they are finally letting it go. Practicing mindfulness during times of sadness and processing grief can help your body find precious moments of peace during a difficult time. This is a short meditation from Jack Kornfield to help you get started. And the Heaspace app is great. Try including some of these foods in your diet to help strengthen the Lungs. They are: pumpkin, rosemary, thyme, coconut, lentils, chickpeas, adzuki beans, and radishes. Even though your stomach may be in knots, it's important to nurture your physical body as well as your emotions. Of course, therapy can teach you techniques to help you cope with the stresses associated with loss. Not fully processing grief impacts every part of your being. Traditional Chinese medicine helps you not get stuck. It offers us many ways to deal with sadness, regret, and the grieving process in a healthy way. If you're feeling stuck in your grieving, please consider adding acupuncture to your self care routine. It might be just what your body and soul need to heal. More specific questions? Let me know. I'm here to help! In 2018: Acupuncture At A Hospital Near You! Even though pain is universal, it is experienced differently by each person. Care often requires an integrated approach that responds to the biological, psychological, and social factors influencing pain. Recently, The Joint Commission published revised pain assessment and management standards. The updated standards, which go into effect January 2018, will require Joint Commission accredited hospitals to provide non-drug pain management options, such as acupuncture. The Joint Commission is a non-profit, independent organization that accredits nearly 21,000 health care organizations and programs in the United States. These new standards are a clear recognition not only of the dangers of opioid abuse, but also the value of non-drug approaches to pain management. They will help people dealing with acute and chronic pain reduce their risk of of opioid addiction, emphasize safe opioid and non-opioid prescribing and use, include patient education on pain management care, and potential side effects of treatment. The traditional biomedical approach to pain doesn't always work well for many people with pain. We know that pain is a complex bio-psycho-social phenomenon, and the way to achieve the best possible pain control is to use an integrative approach. Hence, it is important for clinicians to be educated in integrative pain management. The Joint Commission's timely and crucial pain management revisions will allow greater access to qualified licensed acupuncturists and other integrated health care practitioners to help manage pain. Eventually, acupuncturists and doctors may work together in the hospital to provide the best pain management options for their patients. Have a question about how acupuncture can help your pain? Let me know!